That is one amazing sand castle. It makes me realize I’ve got a helluva lot of sand sculpting skills to learn to do if I ever want to create anything more than a big mound with a “moat” or the ever-classic “Human covered in sand” – the people that create these sculptures are impressive. 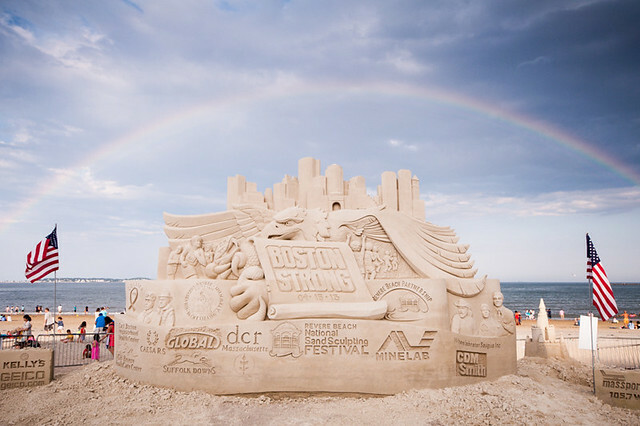 Twenty-five artists created 15 pieces surrounding the Boston Strong tribute sculpture as part of the annual National Sand Sculpting Festival at Revere Beach this past weekend. And the rainbow in this photo is just the icing on the cake of amazingness, very fitting given the sentiments of the sculpture. Thanks to Lee Costa for posting this gem on our We Love Beantown Flickr page. It’s not crazy hot anymore, but we’re still in the thick of summer, so get thee to a beach and get your sand sculpt on!